Although the film opens on a surreal and lonely dream where the main character, Dr. Isak Borg witnesses the death of a man he doesn’t know and his own death of him in a coffin, for the most part, as the title suggests, this film is fairly simplistic. Dr. Isak Borg (Victor Sjostrom) is headed to Lund from Stockholm to receive an Honorary Degree in medicine from Lund University, after being such a success in the medical industry for the past 50 years. 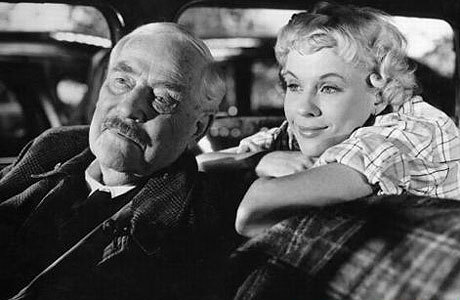 Initially set to fly to Lund, he has a sudden change of heart at 3am (Roman symbolism: 3 = trial, just a cute little thing I’d like to point out, as the film is all about trial) and tells his housekeeper Agda that he’s instead going to drive the distance. He eats a small breakfast, then his daughter-in-law, Marianne asks for a ride with him and that’s the basis of the story. Throughout their travel, Isak comes to learn that Marianne and her husband (his son) are not fond of him – deeming him a cold and cruel man. His personality seems to warm as the film progresses and it’s a very becoming look for the elderly man.